Karaage – Fried Chicken, Japanese Style! Karaage is surprisingly easy; I always use pre-packaged seasoning to marinate the chicken pieces. I recommend the Nisshin brand (the powder is called ‘Nisshin karaage ko’), which is more than enough batter for about 1.5 kg of chicken. 1. Chop 1.5 kg of chicken breasts or thighs into bite-sized pieces. You can also use chicken wings or drumsticks but I prefer ‘popcorn chicken’ without all of the bones. 2. 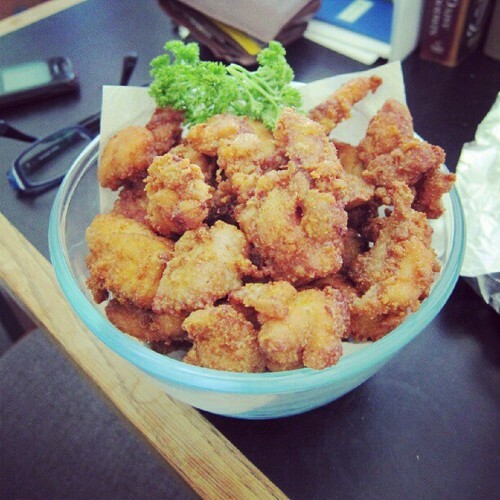 In a large ceramic tray or bowl, coat chicken in karaage seasoning powder. 3. Let marinate for half an hour. In the meantime, set up a wire rack or baking dish lined with paper towels – you will put your fried chicken on this later! 4. Heat a wok of oil or deep bottomed pot. Oil will have to be at least 5cm deep in the wok/pot. Use low-medium heat. 5. When the oil starts to shimmer (you’ll be able to smell it once it gets very hot), carefully use wooden spoons or tongs to gently drop in the chicken. *The oil is VERY hot at this point so you need to take care not to make any splashes. Use wooden utensils that you are comfortable with as these will not conduct the heat as much! 6. Deep fry the chicken in batches. Because the chicken is in bite-sized pieces, it will not take very long to cook – when it turns a lovely golden brown colour and is firm if you press against it with tongs/chopsticks, it is probably cooked. Take one out and slice through it if you want to test it. 7. Put cooked chicken pieces on your paper towel-lined trays so that the paper absorbs excess oil. Let this cool for a good 15 minutes.